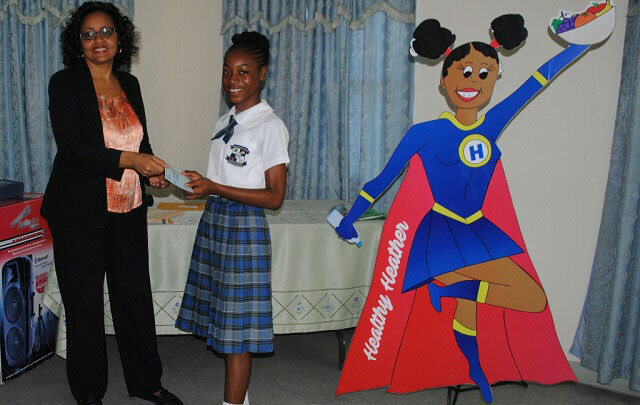 Basseterre, St. Kitts, May 05, 2016 (SKNIS): Shannan Christian of the Saddlers Secondary School proudly accepted her prizes and accolades as the winner of the Nutrition Mascot and Slogan Competition, at a Prize-giving Ceremony, today, May 5. The contest which was coordinated by the Nutrition Surveillance Programme of the Ministry of Health, involved creating a pictorial representation of a mascot. Ms. Christian expressed pride in being able to represent her school, where she said she would begin the promotion of healthy eating among her peers before expanding to the rest of the Federation. Mrs. Matthew-Duncan explained that the contest involved secondary-level students and allowed multiple original submissions by each school. There had been 24 entries. Round One involved a blind review that did not allow judges to know the name, the school, the gender or the age of the students. Round Two was online voting on Facebook and Round Three involved a committee of eight professionals making the final decision. Submissions were judged on creativity and artistic quality as well as how well they represented the chosen nutrition slogan. First and second place winners went to students of the Saddlers Secondary School, namely Shannan Christian and Aziel Belle respectively, while third place winner Chauntia Thomas, fourth place winner Ashan Brookes and fifth place winner Earleane Webbe all attend the Charles E. Mills Secondary School. Mrs. Matthew-Duncan took the opportunity to warn that “obesity among adolescents and children has reached epidemic proportions in the Americas,” where St. Kitts and Nevis is situated.